We changed it up. We are now offering less retreats and opening the space up year round. Book a 2 night or longer stay and create the retreat of your dreams! Join us every morning, or maybe just 1 morning for surf lessons that start at 7am! Monday Wednesdays & Fridays we have post surf Yoga 4 Surfers, Skaters, & all other Shiny Happy People. Classes are on the treetop yoga deck at 10am! Wednesday nights we offer Moonlit Yin Yoga at 6:30pm, Saturdays we get a little freaky with aerial yoga and Sundays were made for our new rad skateboard workout! And Sup Yoga! But we are more than surf and yoga....There is hiking, mt biking, paddle board day trips, and cliff diving too. Check out our schedule page to see what we've been up too! It's been a crazy year for so many of us on the island and we are ready to move things forward with in the most fun, crazy way we could think of! This Thanksgiving is for all of us who have been on the island and call it home, whether you were born here or not, as long as you live here year round, then this offer is for you 2 nights of shared accommodations, and 3 full days of fun! Each day you will get to take an 1.5 hour acro yoga class with Laura Velazques who has traveled the world teaching acro yoga and thai massage before co founding Centra de Salud Integrada de Puerto Rico! And a 1.5 hour aerial yoga class with me. I love the series I have planned for this weekend, from deep stretching, to a little strength training mixing it up with back flips and forward falls and putting it all together for some aerial dance! And if that wasn't enough Rochelle Toussaint will lead you through a Hoopsational hour of Hula Hooping! Get ready to swing those hips, and twirl those hoops! There is still more! Each day you will get an hour to play on the slack line. Test your balance as you glide or at least try to glide across the line. Learn the basics from sitting to walking and maybe even a trick or two. All this is only $340p!!! It's our way of celebrating getting past the storm and to start dancing in the rain! This is the year to make that resolution a reality! This Christmas give yourself the besg gift possible, A healthier more energetic you. And meet new friends while you do it! Join us January 6th to January 12th, 2019 And make the changes that will make this your best year yet! Complimentary check in on January 5th allows you to wake up refreshed and ready to begin. Each morning we will start with challenging workouts, none of which require any expensive equipment. These workouts are designed to challenge you but they are designed so that you can do them anywhere! But while you are here, you will get to do them on the beach, in the park, and overlooking the ocean! Afternoons and evenings we will have fun active activities including, paddle boarding, salsa dancing, aerial yoga, beach hikes and bike tours! During lunch time we will have healthy living life hacks that include nutritional advice, teaching you how to prepare yourself before the cravings begin, some journaling on why you want to make these changes and of course how to maintain them when you leave. We will have chef prepared meals, all healthy and delicious, probably a lot of new taste for you! When you leave you will take a weeks worth of recipes and we will create a private facebook group where I will post weekly workouts and where you can continue to encourage one another, and share your victories and struggles. Accommodations are shared in our eco retreat center, 3 to a casita and all of this is only $1100pp. Early booking bonus of $100 if you book by 11/5/18! Give yourself the best Christmas gift you could possibly give; better health, more energy and meet new friends while you do it! February was meant for Surfing, Yoga, & Margaritas in Punta de Mita, Mexico! I'm packing my bags and you should too! Surf Yoga Repeat! Pack your bags and come to Mexico with me and the amazing Vicki Carson of supcoronado 5 nights and 5 days of 2 a day surf sessions, daily yoga, a snorkel trip to Cenote, breakfast and lunch every day and Night time bonfires, karaoke and other ridiculousness! To keep the price down this retreat is shared accommodations, we will all be in a huge room with 5 bunk beds. But because of that we can offer all of this for only $875pp!!!!!! You can upgrade for another $150 to a private room while available. Punta de Mita, Thursday 2/14 - 2/18 with a complimentary night of accommodations on Wednesday 2/13. Create Healthy & Delicious Food Every night and discover some of the most beautiful & unspoiled scenery in the Caribbean on our Daily Hikes! That, a daily yoga session and a visit to a coffee plantation! Ripping waves and yoga 4 surfers by day, herbal workshops, hula hooping & other shenanigans by night! Start your morning surfing in the blue Caribbean water, after 1.5 hours of surfing we will break on the beach with some fruit and water and review time with your coaches. Then we will paddle back out for your 2nd session of the day! 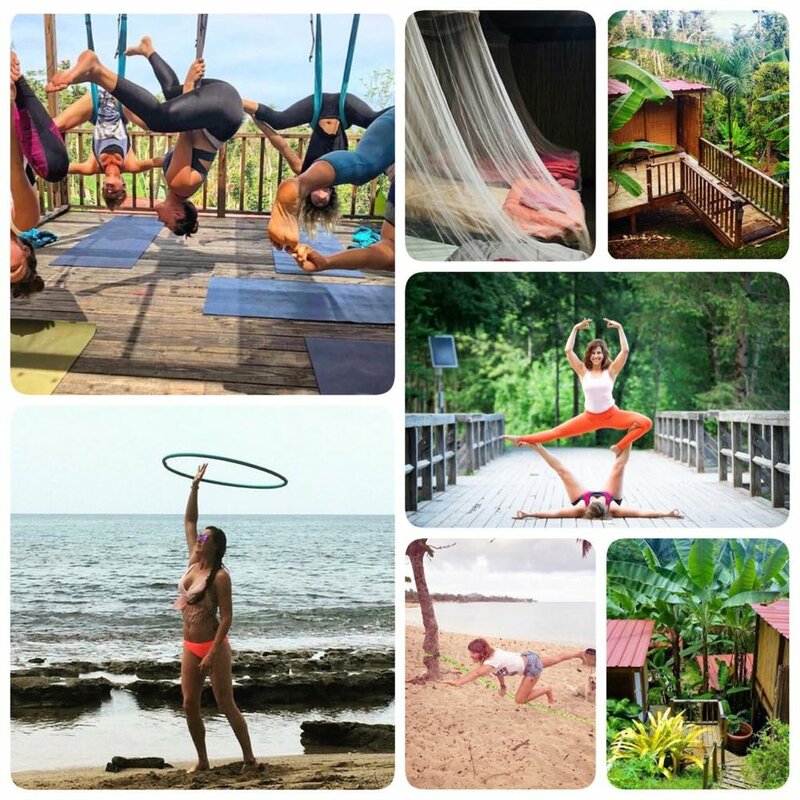 You will have some beach time to relax and or explore before we get into our yoga practice then its time for night time fun, hula hooping, an herbal workshop, salsa dancing and a trip to the almost world famous Rincon Art Walk! Take your surfing to the next level with nightly video review and lots of 1 on 1 attention while discovering a variety of Puerto Rico's best breaks. This 200 Hour Intensive Teacher Training will prepare you to teach a 60 minute strong, safe, Core Based Power Yoga Class. Emphasis is on alignment and the benefits and risk of each asana. You will learn to lead your students into a much deeper, stronger practice, while keeping them safe from injury. Partial scholarships are available. This continuing ed certification is a great addition to your yoga classes. You will learn a flow specific to enhancing your students surfing, at all surfing levels.